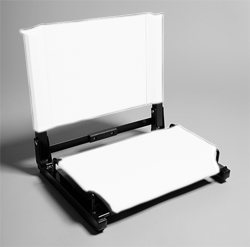 - The Stadium Chair Folding Stadium Seat. and steel frame, bungee cord cushioning. - Bottom hook to secure to bleachers. - Max weight 350 lbs. The Stadium Chair Folding Stadium Seat. Folding stadium seat with canvas back and steel frame, bungee cord cushioning. Bottom hook to secure to bleachers. Removeable stitched back opens up for easy embroidery for printing. Fabric backs not on chair when shipped. Max weight 350 lbs. One Size: 16"H x 17"W x 13"D (open); 4"H x 17"W x 13"D (folded). Imprint Area: 10" x 8" (Front and back). Colors: Black, Navy, Red, Royal. SUGGESTED INK: PA series from Nazdar OR Plastisol Ink (see below note). DRYER SETTING: PA series - Air dry for 8 hours. Plastisol Ink (see below note) - 250°F heat dry 15 seconds + air dry for 15 minutes. Dye sublimation OK  use 300°F and 10-15 second press. OTHER RECOMMENDATIONS: Keep heat under 375°F and keep the heating time less than 30 seconds per press. If more heat is needed, the operator can simply press multiple times.The above information as a “reference guide only”. Actual temperatures, drying times, inks, or other elements of the printing process might vary based on equipment, location, or any other number of factors. Liberty Bags assumes no liability for providing the above information, misprinting, or improper packing and shipping of printed items. For a swatch book print sample test kit, please email.